Once they get a taste of what it’s like to get a good night’s sleep on a memory foam pillow, many people wouldn’t trade back to the uneven and lumpy mess they used to refer to as a pillow ever again. Still, there are times when that memory foam can feel too warm or be too high for a particular style, like sleeping on your stomach for example. What if there was a simple way you could regulate your pillow’s height to try out a new sleeping position and then revert back to the old one? The answer – shredded memory foam. As their name suggests, ComfoLife wants you to have as comfortable a sleep experience as possible, which is why they’ve equipped this innovative pillow with the option of adjusting the amount of foam inside. It sounds weird on paper, but in practice it makes all the difference, and can save you serious money too! There are people who can spend the night peacefully slumbering in one position, and then there are others whose rest period looks more like a wrestling match with the pillow as their most hated adversary. All that tossing and turning requires one to have a pillow which can keep up, and this is certainly it. 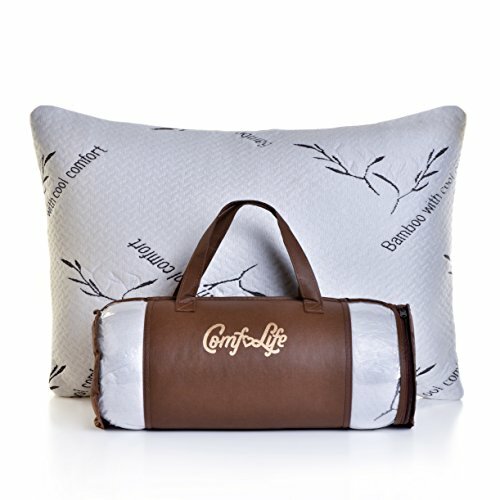 The first thing you see is the pillow’s chic little carrying case made from a brown synthetic material and sporting the ComfoLife logo. Tightly rolled up inside is the shredded memory foam pillow along with its breezy cover that’s made out of bamboo fibers and has an elegant pattern of its own. You’d think that something that came in such a small case couldn’t puff up as much as this pillow does, and you’d be wrong. Once fully expanded, it reaches a respectable height of 5+ inches, more than enough to properly support the neck of someone accustomed to sleeping on the side most of the time. The beautiful part is, if sleeping on the side isn’t your thing, you just take some of the foam out and have a pillow that will correctly alleviate pressure on your muscles while sleeping on your back. The second part of this pillow’s winning combination is its special cover. The bamboo fibers it is made from are particularly adept at heat distribution, meaning that even if you spend the night without moving much at all, the spot where your head is resting won’t get too hot and cause you to wake up as a result. Of course, none of that would make much of a difference if the pillow’s materials would cause you to have an allergic reaction, which is why sufferers from dust allergies and similar plights will be relieved to find out that both the shredded foam and the bamboo cover are hypoallergenic, made from nothing but ecologically-friendly substances and are completely safe for your health. As the pillow contains shredded memory foam, you can expect that this may cause it to bunch up in heaps if you move around on the pillow a lot, especially if you’ve already taken a sizeable portion of the foam out and there’s ample room inside the pillow for the rest of the foam to move around. Other than that, the pillow is on the firm side regardless of how much foam is currently in it, which may not appeal to some sleepers at all. Then again, it is advertised as being firm, so take a look at its specs before purchasing. The way in which you control the pillow’s stuffing is quite ingenious! If you look on the inside, you’ll find a small zipper. If you pull it open, you gain access to a small amount of foam which can then be taken out to make the pillow leaner. Pillows with bamboo casings aren’t the most common, but alternatives do exist, like the shredded memory foam pillow complete with bamboo cover from Clara Clark. It is somewhat more expensive, but well worth considering. ComfoLife’s pillow offers a different take on the standard memory foam filling and manages to surprise with some interesting and unexpected uses of the material. The fact that you can adjust its filling to your own liking is welcome, and the assurance of cool sleep is equally enticing. You may want to continue shopping around if you absolutely refuse to sleep on a firm pillow. If not, you may have just found a winner.